The port is quite an attractive place to dock and you will be moored at the far western end of town. 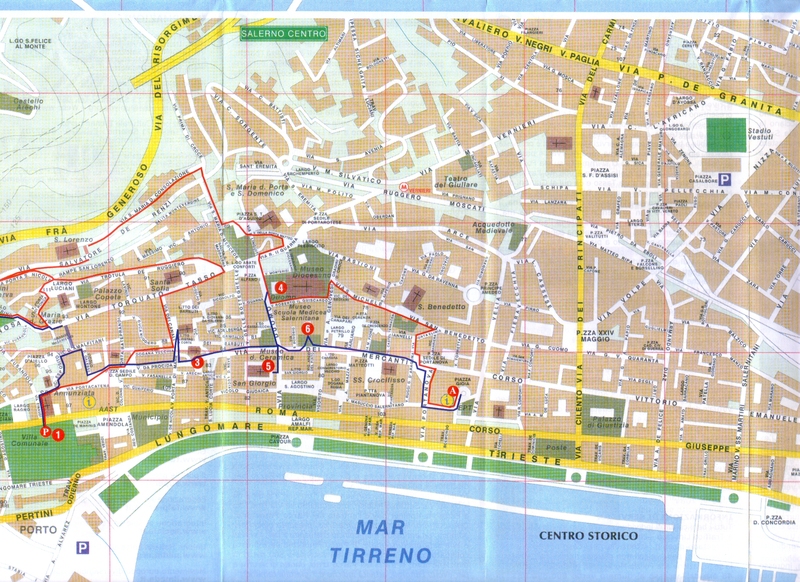 Some cruise lines will provide a shuttle to the Piazza della Concordia (4km). It's about a 15 minute ride. A new, spectacular designed, cruise terminal has opened in 2016. Salerno is a town in Campania (south-western Italy) and is the capital of the province of the same name. It is located on the gulf of the same name on the Tyrrhenian Sea. Salerno is the main town in the Costiera Amalfitana (the "Amalfi Coast on the Tyrrhenian, which includes the famous towns of Amalfi, Positano, and others) and is mostly known for its Schola Medica Salernitana (the first University of Medicine in the world). Once you are docked in Salerno, the center of town near the Villa Comunale with beautiful botanical gardens are within walking distance. You can also walk along the beautiful seaside promenade to the Piazza Concordia where You can take a ferry trip along the coast to Amalfi. It is about 8 euros return. the views are spectacular. Take your swimming gear as there is a very nice public beach very close to port. Some ferries also start right at the Manfredi Cruise Dock, especially when a cruise ship is in port. Check with the Stella Maris Seafarer's Center just before leaving the port gates, they will have the latest info and sell tickets too. It might safe you a long walk or bus ride to the Concordia Pier. Take the ferry to Amalfi, 35 minutes and 8 Euro one way. It is a spectacular ride. Once in Amalfi take a stroll and enjoy this lively, but expensive town. The bus back to Salerno starts right at the ferry dock and the SITA office where you can buy a ticket (2.20 Euro) is right at the waterfront. Make sure you sit at the right hand side in the bus, and you will be in for one of the most spectacular bus rides in your lifetime. (approx. 1 hour). The bus stops very close to the terminal. The port area itself is not particularly attractive, but once you get onto the promenade things get better. Worth a visit also is the Historical Old Town, which has in recent years recovered from being a virtual no-go area to being one of the best preserved historical town centers, full of tiny little passageways and hidden corners. Many cafes in town offer WiFi spots.